I’m not big on alarm clocks, and neither are my teenage sons. Unless. of course, we’re skiing. Then suddenly we have no problem waking up. Like many resorts, Snowmass offers a First Tracks program with early mountain access on certain days. Unlike a lot of resorts, First Tracks at Snowmass is free. It’s one of the best deals going in Ski Country! First Tracks is offered at Snowmass on Wednesday and Friday mornings at 8:00 a.m. You have to have a reservation, which are first come, first served and space is limited. All participants have to be 11 or older, and at least upper-level intermediate skiers or snowboarders. When powder is forecast, the spaces fill quickly and since your name has to be on “the list,” there’s no point trying to poach a spot in line. 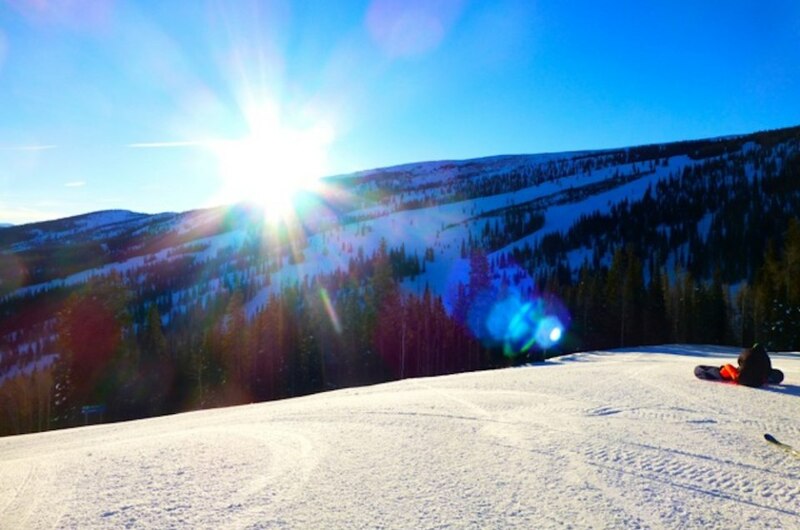 But even when the skies are clear blue, it’s worth waking early for First Tracks. 1. It’s Beautiful. Early morning light in the mountains is stunning. When we did First Tracks in early January, the sun hadn’t yet broken above the eastern ridgeline of the mountains. Riding the chairlift up, the mountains and trees to our right began illuminating. By the time we got off, the sun had crested and we were bathed in light. Based just on these gorgeous views alone, First Tracks was worth it. And we hadn’t even started skiing! 2. The Early Bird Gets the Groomed. Each day at Snowmass, crowds line up at 11:55 a.m. waiting for the rope to drop on the “Noon Groom,” one run of untouched, pristine corduroy. 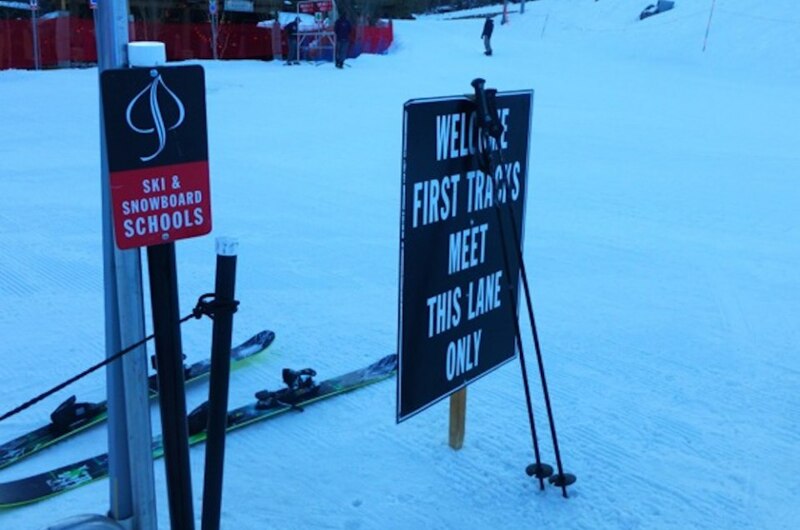 First Tracks offers the same untouched, pristine experience with a fraction of the people. The day we joined First Tracks, our group skied over to the Sheer Bliss lift and had our choice of three immaculate runs from the top of the Big Burn. Yes, powder skiing is awesome, but when there’s no powder, it’s surprisingly fantastic to carve turns on perfectly groomed snow. The runs are silky smooth, and they’ll make you a hero. 3. The Mountain To Yourself. Part of the deal with First Tracks is you don’t get to go alone. 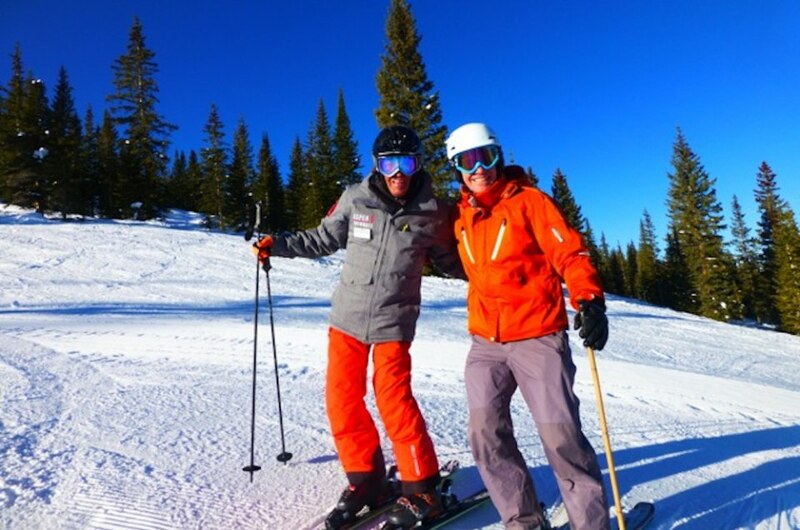 You’ll be with pros from the Snowmass Ski and Ride School, some of them who have clients in tow. These groups quickly disperse to start on the day’s lessons, while the casual participants, like us, pair off with a spare instructor or mountain ambassador for a run or two. At the largest, you’ll be in a group of 5 or 6 people. You get a quick safety talk, reminding you to watch for snow machines and snow cats. The instructors ask that you ski behind them, which isn’t much trouble, since they all can rip. When Snowmass opens to the public at 8:30 a.m., you’re free to ski on your own, having just jump-started your day, in the most rewarding way possible. For First Tracks at Snowmass reservations, call or stop by the information desk in the Snowmass Ticket Pavillion, 970-2923-0560. Reservations must be made 24 hours in advance. Sponsored by Go Snowmass. Plan your trip today!